Tuesday, May 5, 1970. Susan Boyd peered out the window of her home on Iowa City’s River Street. Four bandaged figures, covered in fake blood, lay near the front steps. Along a side street, she saw the Grim Reaper park his Volkswagen, grab his scythe, and join the demonstration. Death was the reason the protesters sprawled across the lawn of the Boyd house. The day before, members of the Ohio National Guard had killed four unarmed Kent State University students who were protesting President Nixon’s plans for a U.S. invasion of Cambodia. Ten days later, police gunfire would kill two students at the predominantly black Jackson State College in a less known anti-war rally fueled by racial tensions in that community. Those demonstrations were just two of many held across the country that spring, as hundreds of thousands of students converged on their college campuses to protest the Vietnam War. Governmental symbols of the status quo, universities and their administrators became targets of opposition. The shootings in Ohio and Mississippi only intensified students’ collective will to demonstrate; in the face of such violence, they raged at the notion of “business as usual” at their universities—and the UI proved no exception. May 4 began as an ordinary spring morning, Susan Boyd* writes in her memoirs, remarking how the blooms on her crabapple tree had turned a lovely shade of deep pink. This tranquil moment soon dissolved into despair when she and Sandy* learned about the bloodshed in Ohio. Sandy’s worry and concern about the local fallout from this national tragedy—and what it would mean to the future and safety of the University of Iowa community—kept him pacing the hallways all night. He had good reason to wring his hands and wonder. The country had just experienced the 1960s, a political and cultural phenomenon unlike anything ever seen before—an era characterized by hope, conflict, diversity, anger, change, invention, and progress that transformed the fundamental fabric of American life. 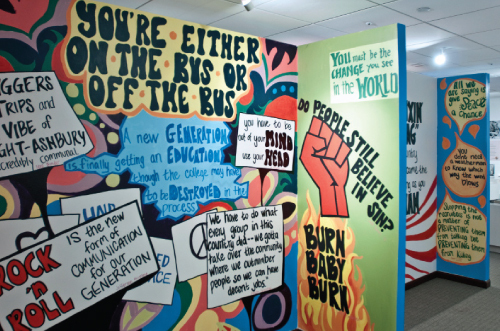 From the late 1940s and 1950s, millions of postwar baby boomers grew into young adulthood, ready to embrace and defend their personal freedom and self-expression and carve a new path. In the aftermath of the Kent and Jackson State shootings, students across the country boycotted class, including here at the UI’s Schaeffer Hall. During the 1960s, the Beatles surged up the charts with Sergeant Pepper’s Lonely Hearts Club Band and Martin Luther King, Jr. passionately declared “I have a dream.” John F. Kennedy died from an assassin’s bullet in Dallas and astronaut Neil Armstrong strode on the surface of the moon. Draft cards burned, young people preached love not war, activists marched on Washington to break the chains of discrimination, and Walter Cronkite brought war into the living room. Events and circumstances collided to create the perfect climate for a mass American uprising; the 1960s, in short, were a revolution. Come senators, congressmen, please heed the call. Don’t stand in the doorway, don’t block up the hall. For he that gets hurt will be he who has stalled. There’s a battle outside and it’s ragin’. It’ll soon shake your windows and rattle your walls, for the times, they are a’changin’. As much as these years symbolized discontent, they also embodied gentler, kinder emotions. “Flower children” wore and handed out floral decorations in the name of peace and universal love, and subscribed to poet Allen Ginsberg’s flower power movement advocating non-violence and passive resistance. In their quest for peace, civil rights, and equality, they began a new conversation about the nation’s purpose, character, and foreign policy. On the Pentacrest lawns four decades ago, they answered the call of their times. 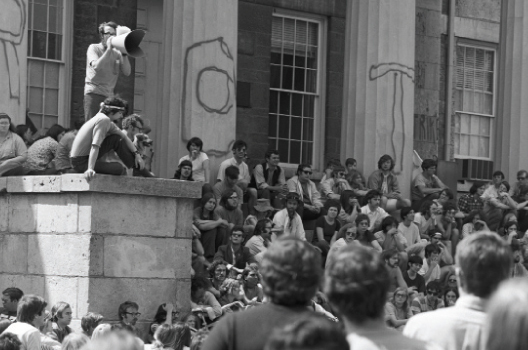 And never had their drive and desperation been more evident that during the first two weeks of May 1970, a singular experience that brought campuses across this country to an unprecedented standstill. Old Capitol drew scores of anti-war student protestors, some who spelled out “ROTC” on the building’s four pillars. In the days following Kent State, masses of students demonstrated their power and political discontent by converging on the Pentacrest. It was almost hard to believe that three years earlier that same location had hosted “Gentle Thursday,” when students passed around candy and hallucinogens and eagerly awaited Allen Ginsberg’s performance of a Buddhist chant. In 1970, the same day Death and the bloodied bodies turned up on River Street, students staged a rally and sit-in to block downtown city traffic. A rock band played on the Old Capitol steps, young men burned their draft cards, and enraged speakers rallied the 5,000-strong crowd. Unmistakable clouds of pot smoke cast a flowery scent on the air. Students congested street corners; some sat right down in the middle of intersections, blankets wrapped around their shoulders to ward off the evening chill. Others read poetry by the light of kerosene lamps or snoozed on mattresses. They demanded a halt to a planned ROTC event with Governor Robert Ray (which ultimately was canceled) and, above all, urged Boyd to close the university in opposition to Vietnam. Many parents and citizens worried about potential outbreaks of violence and also applied pressure to shut down. On the UI campus, others felt the same—and their emotions sometimes boiled over. While the protests were overwhelmingly non-violent, a handful of students threw rocks through glass windows of local businesses. The temporary rhetoric building housed next to the Old Armory mysteriously burned to the ground and National Guard helicopters hovered in the skies. (The university and city decided to call upon the National Guard in response to an inaccurate report that Old Capitol was occupied.) Protestors circulated pamphlets with instructions about what to do in the event of tear gas, while police lined the streets, banging their nightsticks on the concrete in an intimidating rhythm. 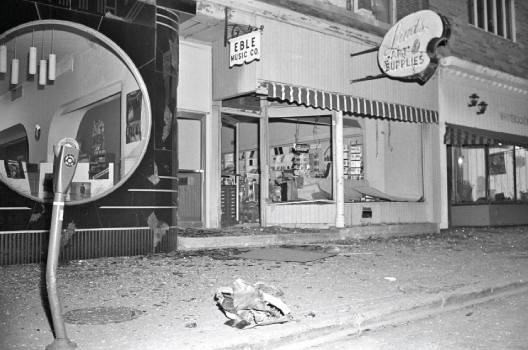 An explosion shattered the storefronts of downtown businesses along Dubuque Street in the spring of 1970, according to the 1971 Hawkeye. That month, city and state police arrested more than 300 people, although no major violence or injuries occurred. Most students flooding the lawns and streets simply wanted to make their voices heard. They did not believe in or wish to fight a senseless and loathsome war, and they worried about their generation. Come mothers and fathers throughout the land. Don’t criticize what you can’t understand. Your sons and your daughters are beyond your command. Your old road is rapidly agin’. Please get out of the new one if you can’t lend a hand, for your times, they are a’changin’. While Sandy Boyd felt sympathetic toward the students’ perspective, he was steadfast in his conviction that their desire to close the university was not the answer. Sharing his sentiments in both letters and official announcements to parents, students, alumni, and others concerned with the UI’s welfare, Boyd declared: “I cannot make the university the political agent of any group, no matter how much I might personally condemn recent actions in Southeast Asia. For those who say that the military intervention in Cambodia is an important symbol at this time, I must respond that learning in a free society is an equally important symbol. If the university were to give in to force at this time, a great principle would be lost. 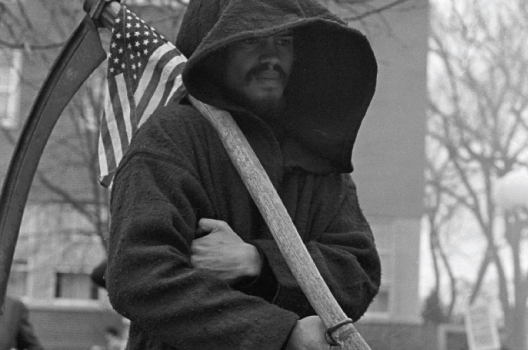 The Spectre of Death—UI student David S. Grant, 67BA, 72MFA—was a frequent sight around campus in those days, a symbol of protest against war’s death and destruction. In the end, more than 11,000 of the UI’s 18,937 students left campus under the early options. With some two-thirds of the student population absent, many people mistakenly remember that week in UI history as a time when the university closed doors. In fact, June commencement came and went—with little fanfare. No matter how the early days of May 1970 and beyond are remembered, the impressions they left were indelible. The people who lived through that time were forever moved and forever changed by what they witnessed and experienced. The line it is drawn and the curse it is cast. The slow one now will later be fast. As the present now will later be past. The order is rapidly fadin’. “Don’t weep for the good old days,” said Hickerson, just as Bob Dylan instructs in his seminal anthem for a generation. “We’re all born to a time in history, and this is our time.” It’s still a’changin’.